Guests listen to a New College student talk about his work at the college. 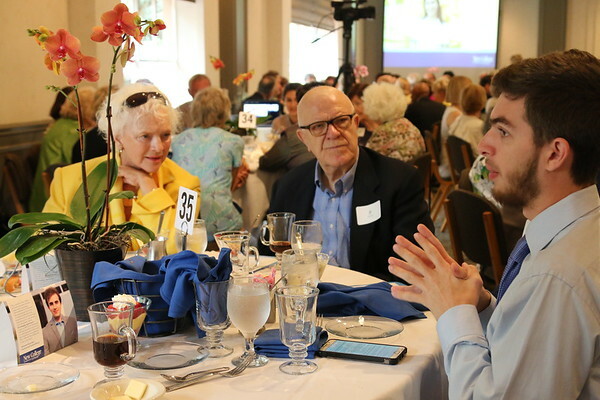 The New College Foundation hosted Our Students Transform the World: New College of Florida Scholars Inaugural Luncheon March 14, at Michael’s on East in Sarasota. Christine Jennings, vice chair of the New College Foundation Board of Trustees, conceived of the event and organized a planning committee that attracted more than 350 guests to the event. Proceeds from the event will support single-semester scholarships valued at $2,500 each and enable 23 students to attend New College for one semester, based on in-state tuition. New College students Alex Koutelias and Cassidy Heaton each described what financial support has meant to their New College experience. 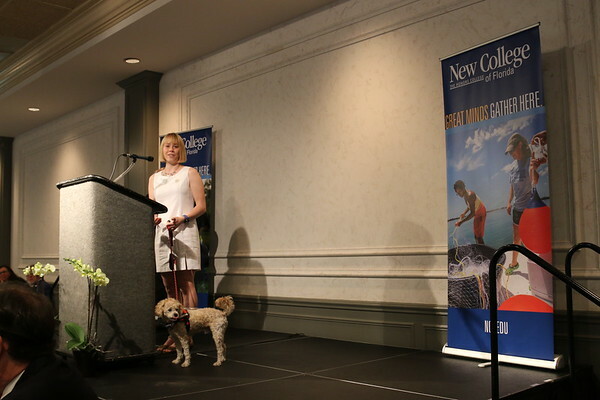 Cassidy Heaton and her service dog address luncheon attendees. Heaton, who initially turned down admission to New College in favor of the University of Chicago, transferred to New College after two years at the university. New College alumna Mary Ruiz, a strategic growth consultant, addressed the luncheon and spoke of the impact New College has had on her life. Ruiz, a former chief strategy officer at Centerstone of America and former CEO of Centerstone of Florida, was the first in her family to attend college. “New College was the only place I wanted to attend,” recalled Ruiz, an urban studies major who went on to receive an MBA from the University of South Florida, “but I had a very big problem. I aimed to be first in my family to go to college, but my family had nothing to spare for my education. Thankfully, New College offered a partial scholarship and I won a national scholarship from General Mills Corporation.” By the time she graduated from New College, Ruiz had a resumé full of prestigious for-credit internships and landed a job within six months. The New College Foundation will continue to host its annual scholarship fundraiser, Clambake, this year Nov. 7 on the New College Bayfront. — Linda Joffe is a communications specialist at the New College Foundation. Associate Director of Communications Liz Lebron contributed to this article.